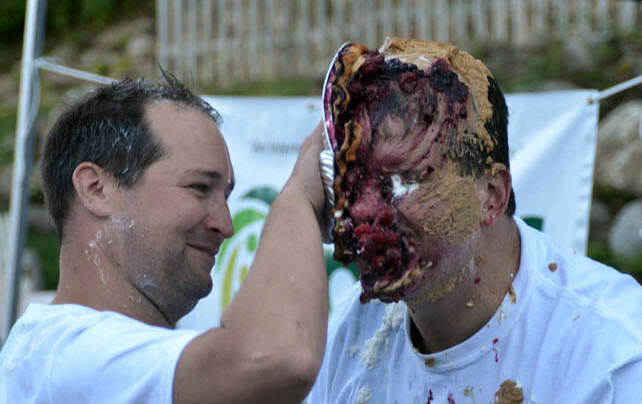 KILLINGTON — On Sunday, Sept. 11, at Moguls Sports Pub 22 volunteer “local celebrities” lined up and took dozens of pies to the face. Whipped cream as well as peaches, cherries and pumpkin were speared over faces with delight — all for a good cause as it was a fundraiser for Chase Kuehl and the Phelan-McDermid Syndrome Foundation (PMSF). Chase Kuehl and his family attended the event, with his father Rick and sister Karena as two of the 22 “celebrities” that folks could pie.